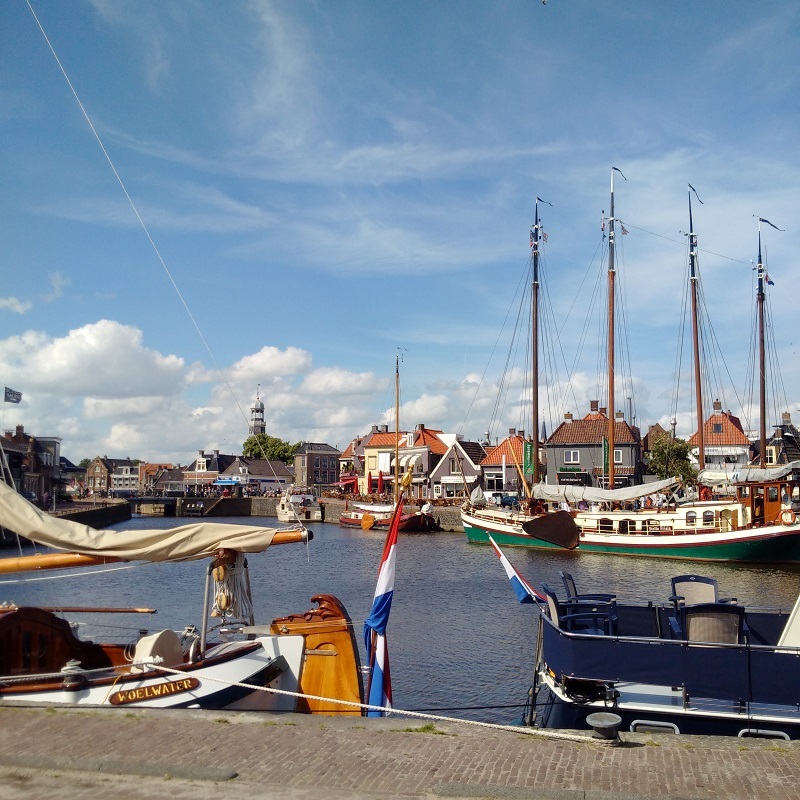 the windy cruise from Sneek to Lemmer and there to find a good mooring with all services such that we could unload the bikes and see the town. The rain was pouring down overnight but, thankfully, it had stopped this morning and it was brighter as I woke up and put the kettle on. I tried unsuccessfully to log into the WiFi this morning and this, plus us already being a day behind our publicised schedule, convinced me that we should cast off today and leave for Lemmer. Before we did that I walked Max, of course, and gave him a good run and then spotted that the ‘antique shop’ by the Waterport moorings was open early enough for us to take a look today and so I invited Kathleen to do so once I got back. It is a fascinating place that has ‘bays’ that people hire for €22.50 per week, rather like a perpetual ‘car boot’ sale and then they get all of the revenue accordingly. We saw lots of interesting things but managed to constrain ourselves to just having a bunch of wooden coat hangers for €1 and no tenant is going to get rich on that! Once back, we quickly set off, waiting for the Lemmerbrug, in the shadow of the Waterport, to open and firstly let a stream of boats through from the other way. I was trying to keep out of their way, whilst controlling Lady Martina in a strong breeze and most of the other boats were in control, but I had to go sharply astern for a motor boat that could not make the turn closely enough! 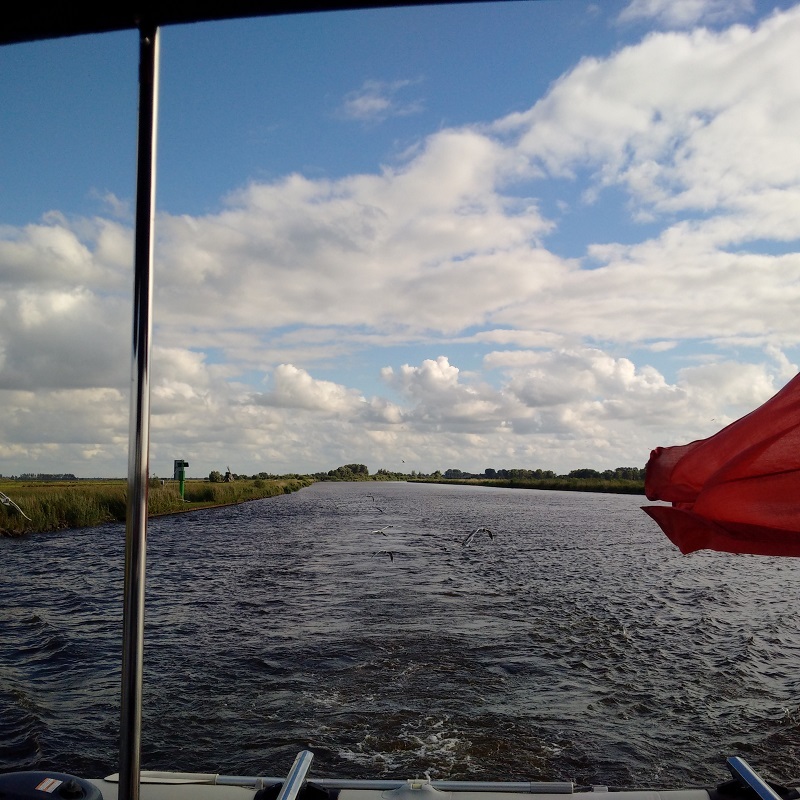 Then the Van Harinxmabrug and the Oppenhuizenbrug opened in turn and we were out in the open, cruising east along the Hokesleat until we turned south along the wide and open Princes Margriet Kanaal when the 9-12knot wind was behind us. It was always going to be a blustery day and the breeze topped 20 knots at one point on the open meers of De Kufurd and the Grutte Brekkan, but I had lashed down our canopy porch in anticipation and all was secure and well with the cruise. This wide arterial waterway is not the prettiest, but it was very efficient way of driving south to Lemmer and the 14nm took less than three hours despite our initial three bridges that needed navigating. The main canal bridges are over 7m and so we could cruise straight under them again, aerials and everything raised. 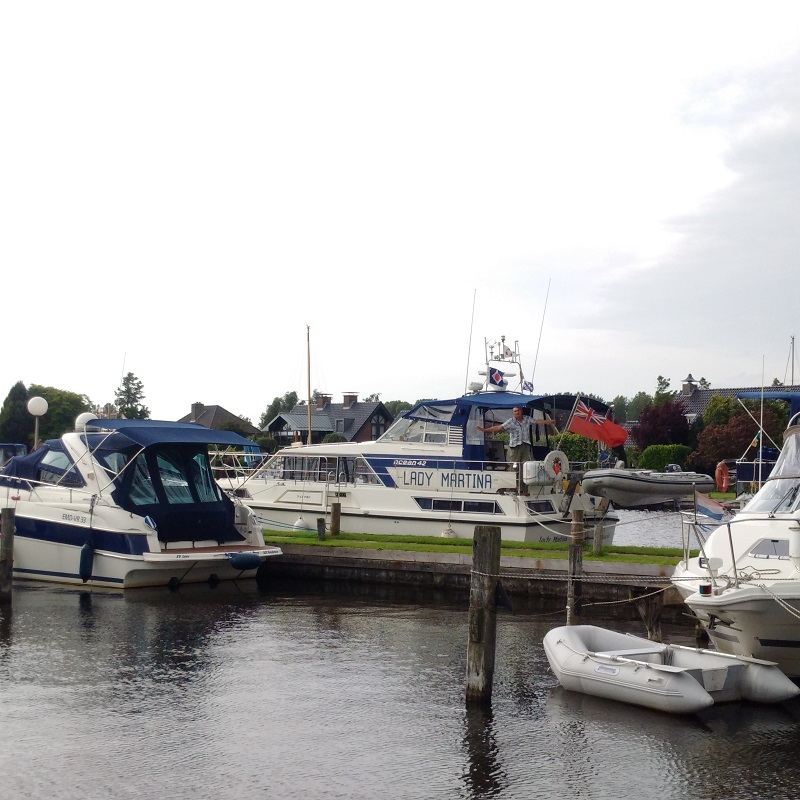 It was familiar territory for me to cruise to port along the Stroomkanaal, once we got to the vicinity of Lemmer, and then to find the Binnenhaven where we could have an alongside berth with unlimited 10A electricity, water and the internet. The latter connection was chargeable at €0.50/day per device but Lady Martina’s Red Box router counts as one and so radiates to all of our devices free, which was quite a coup.